Attention is paid to detail in our engine block service. For more information on our engine block services, see the information below. All checking of cylinder walls and saddle bore size by dial bore gauge. After Blocks are cleaned, they are magnafluxed and visually checked for cracks and defects. 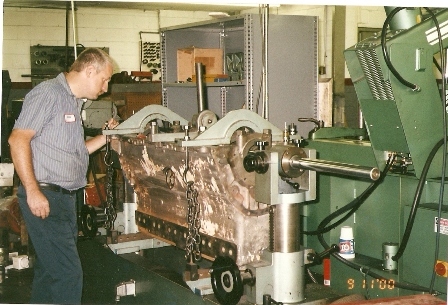 Cylinder boring on modern Rottler boring mill. 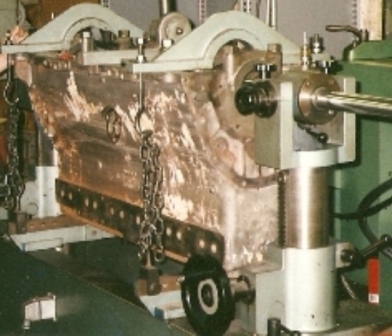 Honing of cylinder walls by Rottler Diamond Honing Machine. Honed for proper size, crosshatch, and finish required for any ring application. Cam bearings and freeze plugs removed and installed. Resleeving of cracked or badly worn cylinders. Decking of block head surfaces. Assembly of short blocks, long blocks or complete engine assembly. Align-honing or Align-boring of main bearing saddles on Sunnen CH-100 horizontal hone and Winona Align-Boring machine.